This Excel Holiday planner will help you stay organized. It has sheets for a gift list, holiday budget, holiday tasks, dinner planning, and many other holiday essentials. In Excel, it's easy to type a few lists, then sort them, edit them, get a total amount, make changes, and print the final lists. 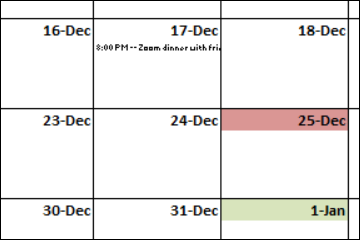 Creating a Holiday Planner in Excel is quick and easy, and you'll love how organized you are! 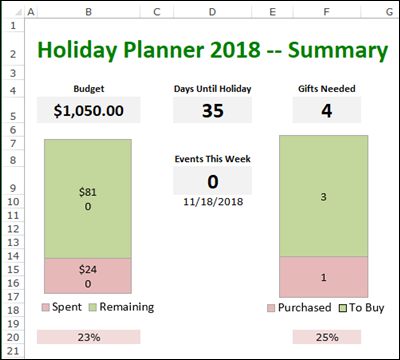 In an Excel workbook, you can add as many sheets as you need to track gift buying, holiday tasks, your Holiday budget, and other activities. After the sheets are added, you can make a cover sheet with a link to all the planning sheets. Thanks to Sarah Stoski for contributing to this Holiday Planner. one sheet at the start, for a cover. Or, click the New Sheet command at the far right of the sheet tabs. To make it easy find your lists, change the sheet names from Sheet1, Sheet2, to something meaningful, such as Holiday Tasks. Note: When you have lots of sheets in a workbook, you might not be able to see all of them. Click the arrows at the far left of the sheet tabs, to scroll through the sheet tabs, or to go to the first or last sheet. Double-click on the sheet tab. Press the Enter key to complete the name. To help you plan and track your gift spending, you can add a Master Gift List worksheet. This is much easier than keeping track on paper, and adding things up with a calculator! Click on the sheet tab where you want to create a list of gifts. Starting in Row 3, type headings for the columns where you can enter people's names, gift ideas, mark the gifts you've sent, and enter the planned cost and actual cost. In Row 1 you can create a SUM Formula, to show a total of costs for all the gifts in the list. 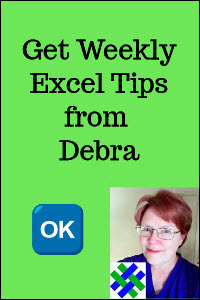 Format the list as a named Excel table, so it will expand automatically as you add new items. You could also create a Holiday Task List in a sheet in your Holiday Planner. In Row 3, type the headings, such as Weeks Ahead, Done, Category, Task Description. Then, starting in Row 4, type your tasks: In the Weeks Ahead column, type the number of weeks before Holiday that the task should be started. In the Done column, type an X when the task is completed. In the Task Description column type the name of the task, such as Decorate the tree. Now that you know how to create planner sheets, you can add any other planner sheets that you need. Download the sample Holiday Planner, below, to see other sheet examples. For example, make a Holiday Card list with columns for Name, Street, City, State, Zip, Sent and Received. Instead of building your own Holiday Planner in Excel, you can use the sample file that I created. Details and instructions for some of the worksheets are shown below. 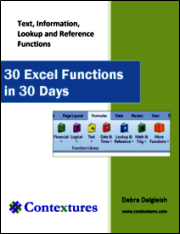 To learn more about the Excel techniques used in the workbook, see the tutorials on named Excel tables, Conditional Formatting, Data Validation and Sorting. 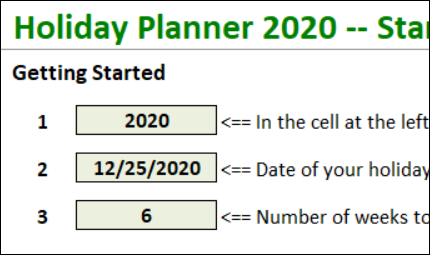 When you open the Holiday Planner workbook, a custom tab (PLAN) appears on the Excel Ribbon, to the right of the Home tab. Click the buttons on the PLAN tab, to go to the sheets in the planner workbook. Then, enter your upcoming activities on the Events sheet, and those items will appear on the Calendar sheet -- up to 5 events per date. Your holiday's date is highlighted with a red fill colour, and the first day of each month is highlighted in green. There's a worksheet where you can enter your holiday dinner time, and Excel will calculate the start time for each dinner preparation step. For instructions on using this sheet, see the Holiday Dinner Planner page. To help you stay on budget over the holidays, there's a Holiday Budget worksheet. Enter the estimated amount that you plan to spend on holiday expenses, such as gifts or travel. Don't enter the Amount Spent or Amount Remaining -- those are calculated from your entries in the Holiday Spending sheet. You can see the totals at the top of the worksheet. To help you track your spending (except for gifts, which are entered on a separate sheet), there's a Holiday Spending worksheet. Enter the date, category, item and amount for each expense. Use the same categories that you entered on the Holiday Budget sheet. The total for each category is calculated, and shown on the Holiday budget sheet, using a SUMIF formula. The Home sheet has a summary of your budget (planned and spent), gift purchases (needed and purchased, days until the holiday, and number events in the current week. To see my example file, download the Excel Holiday Planner workbook. The zipped file is in xlsm format, and contains macros that navigate to the worksheets. Use this workbook to get started, then add your own tasks and information, and other sheets that you might need.